I picked up on G4JNT's Feb 2013 RadCom article on the ebay AD9850 modules. Alan's original project http://www.g4jnt.com/9850DDS.htm gives some extra information. I obtained a couple of sample AD chips at the time and also played with the AMQRP DDS-30 and DDS-60 modules and then the PIC-ELIII development board. Most of the modules I sold at GQRP Rishworth raly. Anyway from ebay I bought half a dozen, just turned up.... not bad for £3 a piece. This is an image of the ebay listing. These are one of the boards. The boards do look the same. There are two 10 pin SIL pins either side so the boards can just plug into a breadboard. They come from china in a jiffy bag so watch out for the pins as some were bent. 69 (some dupes) QSO and 24 DXCC in 4 hours 11 minutes all qrp. This is wintest sound recording of my whole contest. Sound from 22 secs in. heating so looked like a Michelen man! longwire (140ft abt 20ft AGL). Sure plenty will beat my score but it is the taking part that matters. 1. It seems Elecraft have not got the XV transverter functionality working as it might be expected in the KX3. In K3 one option is to use the internal 10MHz as a LO which would be rather nice but that is not available ffrom KX3 at this time. 2. LO will be using a crystal oven. The 472KHz band is 7KHz wide so drift is not an option. 3. No I do not intend including a power output as per XV but I expect that could be added. 4. I 'might' allow input power up to the full output from the KX3 so 12W but it would be safe to stick to lower input. Some sort of intelligent attenuation will add a lot of complexity. The likely LO will be 28MHz put that down to availability of LO and other components. Started to layout a manhatten construction last night, I might transfer to a PCB and 'pretty' the build eventually. 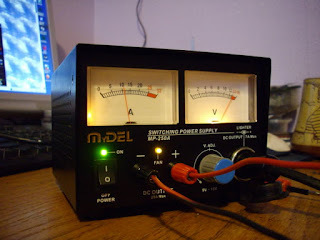 I am going to use my KX3 as the RX and drive of the TX side of a 472KHz setup. I also have an Softrock V6.2 I modified for 500KHz already but it is a bit high I can lower it a bit which might be good as a second RX and sort of panadapter. The KX3 will require an external transverter setup as the LPF would never fit inside. A main HF band colpitts LO, exact frequency will be down to the mixing schema and the KX3 transverter options then use a DBM either one made from torroids and diodes or a packaged version I will look at 602/612 and ADE-1 or and SBL-1 to mix UP the RX 472KHz signals to the KX3 RX IF. It all depends on the response to tests. I have a 500KHz xtal in a test oscillator that I can pull DOWN and I will add attenuation so can do the typical 1uV and 50uV S meter calibration tests to determine which has the better response. Use the same HF band LO as RX, and DBM (decision to be defined) to mix DOWN the KX3 TX IF to 472KHz. As G3XBM has pointed out and it is in the spec sheets you need to limit the input power to the mixers to c10mW so I will need to 'play' with attenuation. The output will be followed by a 1W PA and then a 25W PA using IFR510 and output LPF similar to the GW3UEP versions in an earlier post. SM7UCZ gave me some interesting BUZ MOSFET so I might also try one of them. ATU (see G3XBM ferrite rod design) and antenna will as per 500KHz either be /P beach thing using a 10m pole and loading coil (I used a 2 litre coke bottle wound with tapes every 10 turns) or a 140ft LF long wire I have used successfully at home, with a homebrew variometer made from a section of 6" Yellow gas pipe (when they replaced the mains to the street I asked for an off cut if they had one and was given a couple 6 foot lengths!) and a smaller 3" white PVC pipe that would go inside. 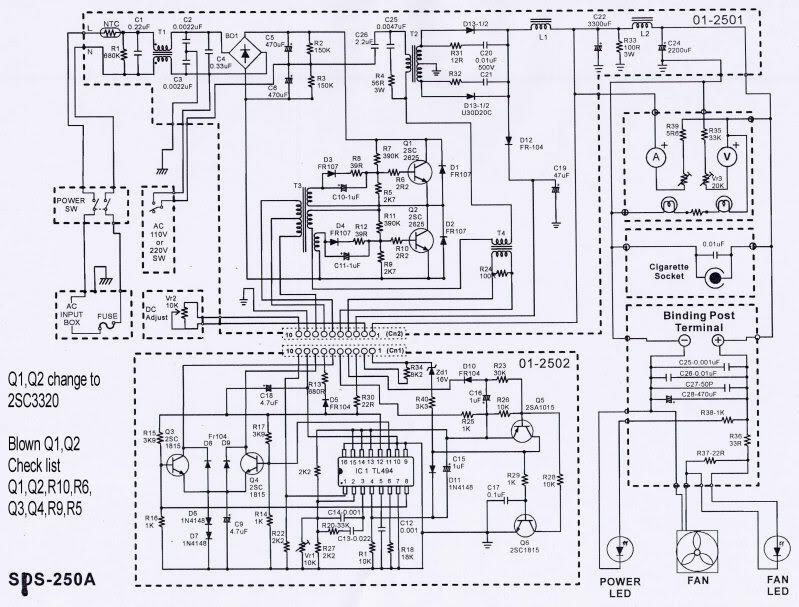 The easiest HF LO to choose might be 28MHz so that the dial reads 28.472 to 28.479 giving 472 to 479 KHz but as I mentioned it depends on the KX3 transverter setup Elecraft said if you want 472KHz build a transverter and use 7MHz IF. I have a second KX3 that does not have the AUTO ATU so will need to make sure the transverter matches well. KX3 RX on 472KHz directly is poor so you could not use it as you might an FT817. As the circuit has not been released and there is no obvious place where you could inject a 472KHz RX signal. I am sure it is possible but it is not recommended that you bypass the KX3 front end filters that will effect normal operation. It 'might' be possible to control from the KX3 menu system.. Copyright © 2012, Elecraft, Inc.
transverters based on the band selected at the KX3. This is further explained below. the parameter to YES to enable band n.
? XVn RF sets the operating frequency (MHz). 50 MHz). Use 50 MHz for the KX3-2M option. for the current transverter band in watts (0-1). Use 0.3 watts for the KX3-2M option. TRN1-TRN7 are recognized for this purpose. GPIO signal is inhibiting transmit, the TX icon will flash as a reminder. 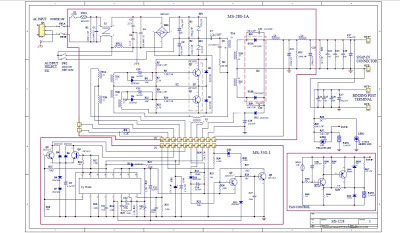 this case a 3-V to 5-V level translation circuit can be used. recall, direct frequency entry, or computer-control commands. using the low-power KXV3 output (XVTR OUT). to turn the transverter band on. transverter, you can set it to the lower edge of the higher band. select the transverter band.) I.F. selections include 7, 14, 21, 28, and 50 MHz. Use 50 MHz for the K144XV internal 2-m module. external transverters, not the KX3-2M module. Tap 1 – 9 to select band. have their own T/R switching and be able to handle the specified power level. signal from the KX3’s synthesizer. (tip=auxBus, ring=key out). TRN0 is used with the KX3-2M module (internal). Tap 1 – 9 to select the transverter band; rotate VFO A to select the address. XV1 OFS and XV1 PWR menu entries are not applicable in this case. Mine is based on the 472KHz VFO http://www.gw3uep.ukfsn.org/100W_QTX/472_kHz_vfo.htm and 25W PA http://www.gw3uep.ukfsn.org/25W_QTX/472_25W_QTX/472_kHz_25W_PA.htm from GW3UEP. I have the PA from the 500KHz TX that is in this blog based on a M0MBU design as well. I have a number of variable capacitors and a die cast box fore the VFO stage. So I expect to be qrv on 472KHz and 5MHz shortly. I will not run some MOPA station (i.e QRSS or WSPR beacon) but will be a real op at a key (472KHz) or on a mic (AM 5MHz). Will try a modification of the ZL2BMI on 5MHz perhaps.. So went further and looked as discrete resistors about the transistors (R5,R6,R7,R8,R9,R10,R12)... one of the 1/2w resistors was open circuit. (R6) Visually did not look like there was a problem. Value was 2.2ohms 1/2W so not one I have normally but I do have 1/4W versions... so I did the parallel/series dodge and using four 2R2 1/4W made up a 2R2 resistor.... I have at least 1/2W capacity and should be fine. Those transistors are rated at 15A and 25A surge, the power supply is supposed to be 25amp... hum... so I think I'll be careful. Rev George Dobbs (G3RJV) has added my note to him about C5 and 6W trip with new KX3 last Summer to his RSGB QRP Column. It perhaps shows that DX trips are not only for those with a dozen members and 400W although maybe not that rare a location. Given recent events maybe I should have tried harder for TZ. Hoping to manage a couple trips this year. BERU in March (9th/10th) hoping to get away from all the snow and ice and will be somewhere suitably warm, QRS and QRP only of course. First will be Portugal CT (Not that DX but I'll be on a beach again), might also try to get to ZB2 but not sure if can be QRV. I will be in Sweden during June and last w/e in July planning to be on an island off UK coast line (puffins and seal allowing of course). Later in the year hoping for something more DX though. Needed to be up 08:00 - 18:00 UTC or 17:00 - 07:00 Local time so nearly all the operation was overnight. Local sunset was about 6pm local time with dust between 5:30pm and 7pm, total darkness after that until runrise near 6am. I visited several stores in Pago Pago, a hardware store just past the MacDonalds on the road towards PAgo PAgo centre from Sadies where I bought the battery jump leads I used to recharge the KX3 batteries. The SUV I rented was from Dollar. You REALLY need to arrange rental cars well before arriving as they usually all get rented out between the flights (bi-weekly) into and out of American Samoa. On the North side of American Somoa main island, north east shore beach nights of 8th, 9th and 10th October. QRV 07:00 UTC 8th (about 3am local time masts broke), 05:00 UTC 9th (mast broke again during night) 05:39 RV9CPB was first QSO followed by UN7TW and 06:02 UTC on 10th. Both before 8th and after 10th I operated from the South shore near Sadies. 14.055 CW although I was QRV 14.015-14.035 as well (G3SXW recommendation). 21.055 CW although I was QRV 21.015-21.035 as well (G3SXW recommendation). The beach location would be great for 40m, 80m and 160m but when I was there the night time winds were too strong to allow me to support the 10m poles I had taken for a phased 40m/80m antenna and broke, if I had planned better before hand (trip was very hastily put together) I would have made sure I had adequate guys. There is plenty of availability of stranded insulated wire, e.g. US mains zip cord can be obtained in long lengths from numerous locations as well as various guy cord as the island main export is tuna so there are hardware stores selling all manner of suitable materials. The local garages and car sales all have surplus, some brand new but not current model, car and larger vehicle batteries as there is no local recycling so a power supply that is suitable to float charge one of these batteries might be advisable. Note they WILL BE much more expensive that might be obtained in EU/UK or US. I never found a source of long poles although it was possible to obtain lengths of Aluminum and Steel tubing up to 2" diameter from some of the hardware stores. Have been asked for a few words about KH6, where, when and what frequencies I was QRV from KH6/M1KTA. I hired a car from the Honolulu airport and drop through Honolulu pased Diamond Head and Hanama Bay (I had been to both on a previous trip), follow the coast for a while longer and just as you start to head up the NE side of Ohau you will come upon a layby with a number of 'surf dudes' complete with VW camper vans etc and a layby off the main road. I pulled in and at the far end of the car park stopped next to and between a row of tal palm trees. 40m and 80m had no disernable signals. All 5W from my KX3 #1082 into a W3EDP (84ft & 17ft counterpoise) hung vertically up one and then horizontally between two tall (30ft+) palm trees at the edge of the car park on the shoreline right by Sandy beach. A good operating location for any that look for one in the future. Sat in the shade by the car I was operating with power coming from the battery of the rental car using a set of jump leads, as the KX3 had no other power. The car was left running whilst I operated. QRT just after 12:00 local time, completely forgot to take a photo of the setup but did take a photo of Sandy bay (because the QSL card) and returned to airport for flight to Houston where I met up with AE5X. I'll be CT1/M1KTA/P between 9th and 17th Feb. Note that both are open and one had cratered. 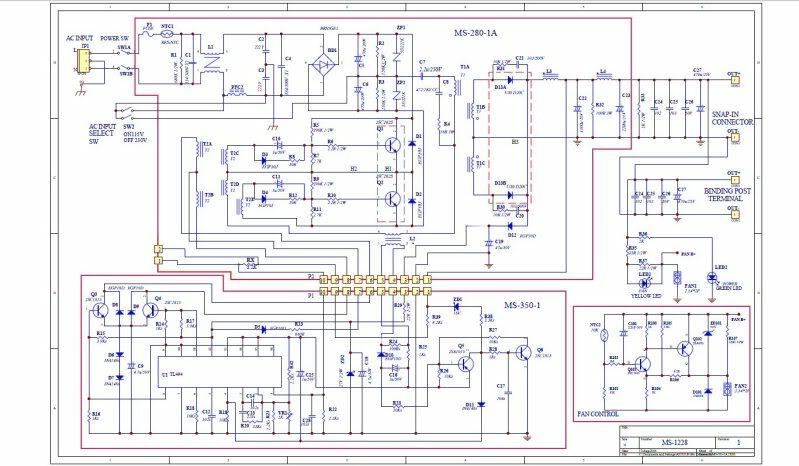 This is the RF board of my KX3 before I start building. Just applied for my 472KHz Nov. I'll be trying the VFO from http://www.gw3uep.ukfsn.org/100W_QTX/472_kHz_vfo.htm with the PA I built for 500KHz. Arrrgh used wrong email address... NoV still processing. Asked this a few times so I post it here, you will have to confirm with PURA if these details are still correct though. I take no responsibility if they are wrong. This is dealing with mains voltage so do not do this unless you know what you are doing as the voltages are lethal. 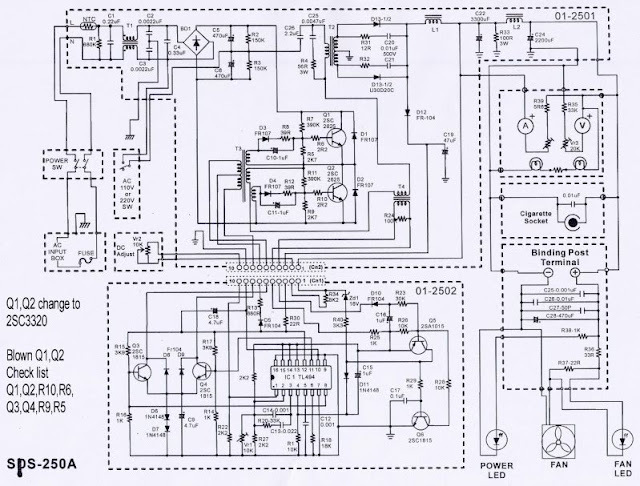 It took a bit of digging to find the circuit diagram (thought it was on the pdf that came with it), still haven't found it exactly but this is very similar except mine appears to run the fan full all the time instead of having a fan control board on the lower right here. These power supplies are widely in use and all are called SPS250A in the name and are all made in China under various names... so if yours has SPS250A in the name and looks like mine then chances are it is the same but no responsibility if it is not, use information at own peril (and this is running at mains voltage which can kill so do not do this without a healthy respect for high voltages). This is the same supply just a different brand name 'MyDEL' mine says Sharman. 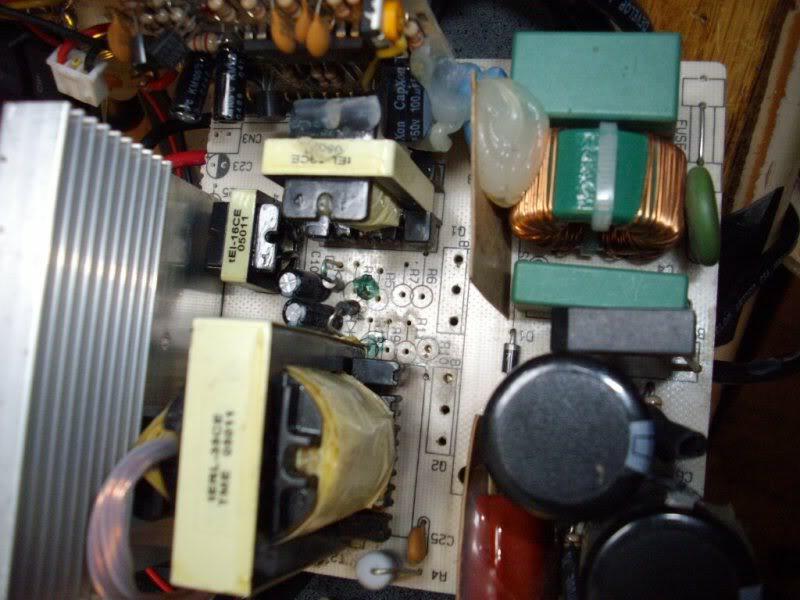 The two NPN power transistors 2SC2625 were removed still attached to their heatsink. Note all the common mode filtering on the input side (top right corner). Mine has had the right hand transistor crater and the other is short circuit between the pins. I'll add the photo of mine shortly. Anyway suffice to say power supply can be easily repaired. 2Sc2625 were available from a number of sources but ebay was the cheapest. I hear that it might make sense to replace the 2Sc2625 10A versions with 2Sc3220 which are 15A versions but I could not source them when I looked but they are also on ebay often enough. I have a new video card and water cooler for the CPU coming. I'll get the website back up shortly.